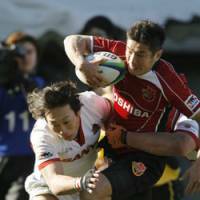 The Toshiba Brave Lupus are back on top of Japanese rugby, even as scandal looms on the horizon. 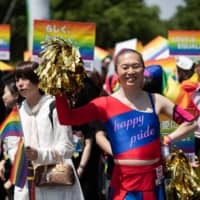 The sixth Microsoft Cup tournament, Japan’s Top League rugby playoff, ended with Toshiba overpowering Sanyo Wild Knights 17-6 at Tokyo’s Chichibunomiya Rugby Stadium on Sunday, in front of 17,000 spectators. Toshiba had much to be proud of, gaining back the title it owned for three years prior to its elimination in the semifinals last season. Despite the team’s stellar performance, the victory was still overshadowed by the recent conduct of its players off the field. At the postgame ceremony Toshiba captain Yoshiaki Hirose accepted the Most Valuable Player Award, but there were tears in his eyes, and a sense of uneasiness prevented the team from fully celebrating its hard-earned victory. Toshiba is currently awaiting the secondary results of a doping test of one of its key players, Japan national team winger Christian Loamanu, who initially tested positive for marijuana in a drug test conducted Jan. 12 by the Japan Anti-Doping Agency. If the second test results return positive, Toshiba will have to pull out of the All-Japan Championships later this month. “We are truly sorry about the recent incidents. We feel we have betrayed the rugby world and the sports world,” acting Toshiba coach Kenichi Wada said Sunday at the postgame news conference. Wada replaced head coach Tomohiro Segawa after Toshiba team member, lock Vivili Iongi, was arrested on suspicion of theft of ¥10,000 from a taxi driver Jan. 4 in Tokyo’s Shibuya district. The hardships the team faced over the last month, however, appeared to be a motivational force for them on the field Sunday. Toshiba dominated the game in the first half with a well-organized and focused attack plan. The Cup winners were also blessed by unpredictable, strong northerly winds that prevented Sanyo from relying on the kicking game of former All-Blacks fly-half Tony Brown. 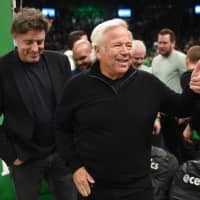 Returning to the game after long hiatus, during which he battled the life-threatening injury of ruptured pancreas, Brown was clearly not in top form and left the field at halftime. First-half scoring started with Sanyo kicking prodigy Masakazu Irie, this time playing at inside center, successfully converting a penalty kick against the strong wind. The rest of the game, though, was dominated by Toshiba’s offensive. Toshiba wing Tomohiro Semba capitalized on a fumble by Brown, and following his pass, Hiroki Yoshida scored the first try of the game in the 23rd minute, which was converted by fly-half David Hill. Pressure from Toshiba kept the ball deep within Sanyo territory, and four minutes before halftime, a superb pass from Toshiba scrum-half Jun Fujii sent captain Yoshiaki Hirose pirouetting through the Sanyo defense from the 22-meter line to the tryline. 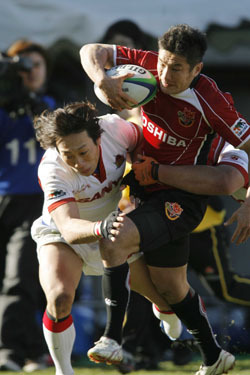 A tackle by Sanyo’s Ryu Koliniasi Holani came too late, and the MVP player touched down in the right corner, a difficult angle from which Hill missed the conversion kick. Irie, on the other hand, made sure that his kicking game stayed intact, even against the wind. His successful penalty kick sent the teams to halftime at 12-6. 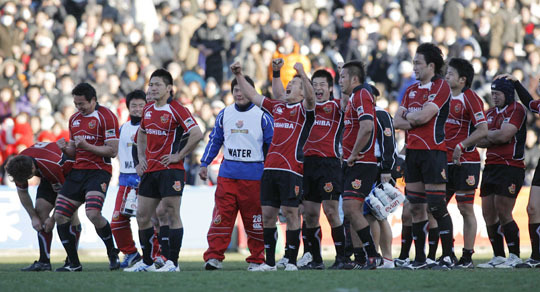 The game’s second half, however, was dominated by Toshiba. The Brave Lupus constantly hounded their opponents until the final moments. 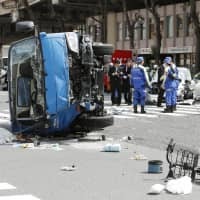 The team pushed its trademark rolling maul over the goal posts in the last minutes of the game, though the score was disallowed after referee Shinji Aida consulted with TV match official Fumitaka Kono. In a vain final attack, Sanyo briefly gained control of the ball, but a handling error by center Seichi Shimomura behind Sanyo’s try line opened the door for a match-clinching score for Hirose. “It was a good game,” the tearful team captain said afterward. “It is difficult to put it into words. We prepared very hard for today, because of what has been going on off field. Whether this victory proves to be a bittersweet one will be determined in the coming weeks. For the time being, the Toshiba players can hold their heads high.